Necromancer/Knight boards are going to get messy, but maybe we can cut out the middleman. Doge isn't Facebook cancer, it's reddit/tumblr cancer, which is much less severe. The main difference is that it was funny for the first day (which was years ago) whereas the brain thing or the unfaithful boyfriend were never funny for a second. "I liked a meme once. It was terrible." Man, I do like memes. Some of the best ones are paint art (foreigners ruined that one Donald Duck face by calling it Dolan and overusing it but the rest of the meme is still top tier), uusi mene on syntynyt/new mene has borned, getting, Kyon-kun denwa, the Navy Seals pasta, old school Spurdo Spärde and some of the newer Spurdo variants (such as snibeti snab x--DD variants and hi where are the burger variants), >lörs lärä variants (I know lörs lärä is not the original but the original is impossible to spell without looking it up), to name a few of the less obscure/community specific examples. Gain a playable card from the Supply. Set aside a copy from the Supply and place your Brain Sparks token on it. At the end of any turn in which you play a copy of the card, if you played it more poorly than each time you have played it since you put the Sparks token on it, add a Victory token to the pile and take as many VP as are on the pile. If you fail, gain a Curse, remove the tokens, and return the set aside card to the Supply. These aren't really bad card ideas. In fact, Dr. Jekyll/Mr. Hyde is surprisingly similar to to an official card announced two days after your post (Werewolf), both thematically and mechanically. So now we have an official card that was almost predicted in the RCBI thread. Depends on whether Feodum or Cursed Feodum is on the board. Gain 3 coppers. 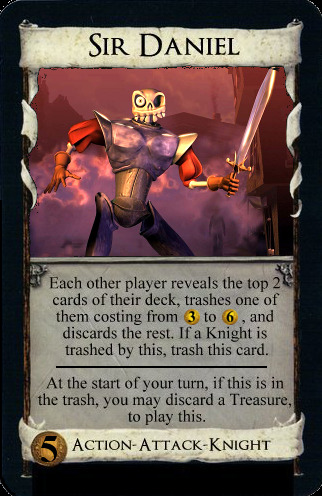 Trash a card other than Copper (or reveals a hand with all Coppers). Reveal cards from your deck until you reveal a silver or a gold, putting it into your hand. You may trash one of the other revealed cards and discard the rest. If you didn't reveal a gold or a silver, gain a silver to your hand. Play this twice as if it were an action costing up to $4, and then put it on your island mat, returning it to your deck at the end of the game. This should be worth VP. 2VP is probably fair since it only sets itself aside. idk if playing as any action twice is a big deal or not. It could also potentially be powerful if it loses track of itself somehow and then stays off the island mat. Maybe IoMT should set itself on your mat and *then* play as an action costing less than itself (once or twice). I think whatever card it's imitating would have lost track of itself at this point. Even if it's a Reserve card and successfully goes onto your mat, it would no longer have that identity unless you specified "it is that card until XYZ". Since you don't want the card to go in play in the first place, "it is that card..." can be scrapped entirely. Even if the card keeps track of itself, as far as I know, there are no cards which can make it back into your deck just by playing themselves if they were played to the Island mat. At best they can go to the trash pile or get stranded on the Tavern mat forever. You may trash a Cursed Goat from your hand. If you do, +4 cards. Gain a Curse. You may trash a card from your hand. 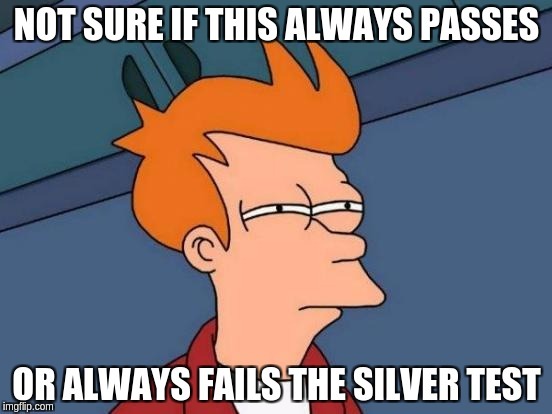 Gain a Silver per Silver you have in play. Each other player discards a copy of a card you have in play (or reveals their hand if they cannot do so). If this is the second time you played this card this turn, +2VP. If this is the third time you played this card this turn, +3VP. Pass the top card of your deck to the left. The player to your left looks at the card and puts in their hand or puts it back on top of your deck. +1 Action. Reveal the top 4 cards of your deck. Put the revealed Victory cards and copies of Self-Synergy into your hand. Put the other cards on top of your deck in any order. Trash this and a Self-Synergy 2.0 from your hand. If you trashed two copies of Self-Synergy 2.0, gain 4 Golds onto your deck. Trash this and the top 4 cards of your deck. If you trashed a Scout, gain 4 Golds onto your deck. When you gain this, look at its back. If it's a Golden Ticket, gain 3 Wishes from their pile. Otherwise, gain a Silver. Return this to the Supply and shuffle the Wonka Chocolate Bar pile. Action, cost 5, you win the game. Reveal the top 4 cards of your deck. Put the revealed victory cards into your hand. Trash one of the remaining cards. Discard one of the remaining cards. Put the other remaining cards on top of your deck in any order. I'm not sure you got the wording, but multiple copies don't count because it has to be the same card, not just another Rudolph. The point being that this card is just a straight cantrip unless you Throne, Carriage, or Court it. This card is total garbage and the other reindeer laugh and call it Pearl Diver, but then Santa steps in and changes everything.